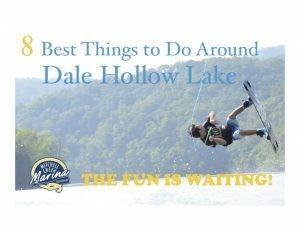 Water Safety Tips from the U.S. Army Corp of Engineers for Safety at Mitchell Creek Marina on Dale Hollow Lake – We want you safe! When underwater and under the influence of alcohol or drugs you can suffer from an inner ear condition (caloric labyrinthitis) that causes you to become disoriented and not know which way is up. Also, boaters can develop “boater’s hypnosis” a condition in response to sun, wind, noise, vibration and motion which causes fatigue and slows your reaction time. Combining that condition with alcohol or drugs greatly reduces your coordination, judgment and reaction time, which could lead to deadly consequences. Many drowning victims are within 10 feet of safety, having unintentionally entered the water. You should never go near anybody struggling to stay afloat because you could drown too! To help rescue someone extend a pole, stick, line, or clothing to reach them or throw something floatable to them.The “Reach, Throw, Row, Go for Help” rescue method is used to avoid multiple drownings. Besides wearing a life jacket, learning to swim well is one of your best defenses against drowning. Also, teach those you love and practice simple survival floating skills; remembering how to relax and float when exhausted can save your life. Swimming in natural or open waters is not the same as swimming in a pool. The USA Swimming Foundation works with local partners to offer free swimming lessons. Find a location near you athttp://swimfoundation.org/Page.aspx?pid=347. Before every trip you should perform a safety check of your vessel. It is your responsibility to make sure you have all the required equipment on board such as life jackets, throwable device, certificate of number (state registration), fire extinguisher, visual distress signals, sound producing devices, and whatever additional items Federal and your state’s laws require. Check your engine, ventilation, backfire flame arrestor, electrical systems and trailer before you go. Take advantage of free vessel safety checks offered in your area by boating-related agencies. See Federal Boating Requirements athttp://nyss.com/federal. Commercial vessels have to stay within the navigation channel on rivers. An average tow boat pushing barges can take ¾ to 1½ miles to come to a stop. If you can’t see the pilot, he or she can’t see you, because a commercial pilot’s blind spot can extend for several hundred feet to the front and sides of the vessel. To learn more about how to properly lock through visit this link.